Welding Safety - Spot Weld, Inc.
Safety in resistance welders has become a primary focus in the last 10-20 years. Because of the inherent pinch-point between the electrodes, numerous solutions have been developed (some with varying degrees of success). Below we list some of the most common. The Unitrol SoftTouch has been available for many years. It is only recently that it is available as a stand-alone system. 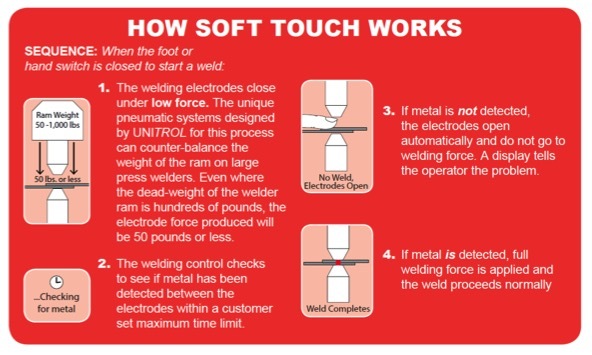 That means you don’t need a Unitrol weld control to install the SoftTouch Control. This system Protects against pinch-point injuries with a passive system. It does not need to be adjusted with every new welding setup (like some systems require). It installs on any type of spot welder. It works by keeping the electrode force low (below 50lbsf) until it is safe to apply full welding force. With certain types of weld nuts, the Soft-Touch system can even double as a weld nut Verification System (Nut Verification System [NVS]). 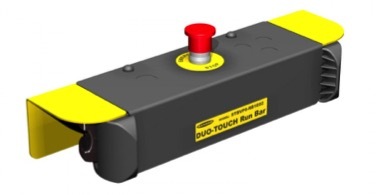 This passive redundant system has been accepted by OSHA in manufacturing plants nationwide. HOW IT WORKS: After initiation, electrodes start to close under LOW FORCE. A UNITROL TOUCH SENSOR system decides when the electrodes have closed on or near the metal being welded. If an obstruction is detected prior to closing, the electrodes will go back to the fully opened position. 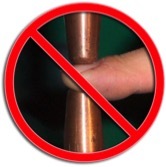 No adjustment of SOFT TOUCH is needed when changing welding force or electrode spacing. The system is field adjusted (lockable settings) so that force between electrodes for the advance portion of the stroke remains low enough to avoid major injury to the operator’s fingers. For press welders, this will even reduce force between electrodes to considerably less than the dead weight of the ram. FAIL SAFE SYSTEMS: If the sensor switch is already closed when the welder is being initiated, the electrode will not even start to move, and the display will show which sensor input is closed at that time. If the sensor wires from the SOFT TOUCH system have become disconnected or are making poor contact, the electrodes will close under low force and then return after a short field-settable delay (1-99 cycles). HEAVY WEIGHT RAMS: This #9181-34W kit is used on: PRESS WELDERS that have dead weight (with air disconnected from welder) of over 50 pounds. The kit is factory pre-plumbed for fast installation and includes all necessary components and interconnecting tubing. PRESS WELDERS that have dead weight (with air disconnected from welder) that is less than 50 pounds, or does not drop by it’s own weight. ROCKER ARM WELDERS The kit is factory pre-plumbed for fast installation and includes all necessary components and interconnecting tubing. PRESS WELDERS that have dead weight (with air disconnected from welder) of less than 50 pounds and drops smoothly by gravity. The kit is factory pre-plumbed for fast installation and includes all necessary components and interconnecting tubing. REDUNDANT SENSOR: You can also add your own proximity switch or LVD system adjusted to close a switch when the electrodes are less than ¼” apart to the system. The SOLUTION will not turn on the high-pressure valve until both metal is detected and the proximity switch has been closed. This is often useful for applications where the parts being welded are not flat prior to the welding process. No User Calibration, EVER. Just install and turn power ON. Always Ready to Protect: Does not have to be calibrated even when you power-up, change material or change tooling. 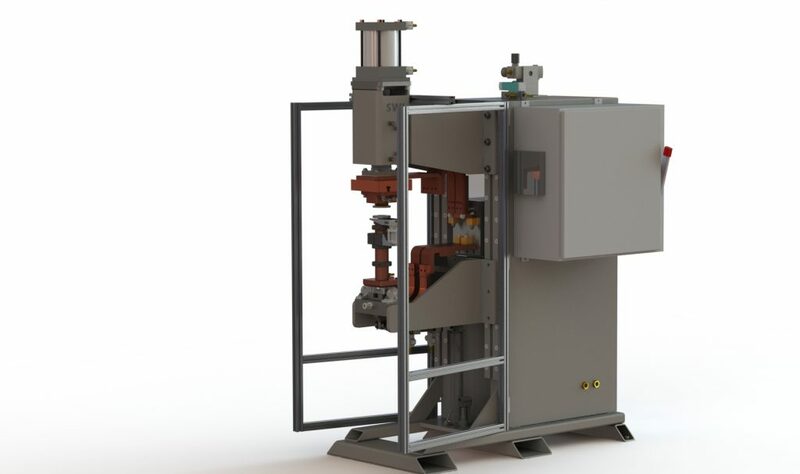 Full Electrical Redundancy: All inputs and outputs require closure of both electro-mechanical and solid-state redundant components for full safe operation. Self-monitors output relay to prevent any operation if a fault is detected. Electrodes Close Without Initial Delay: Electrodes start to move at the same time the welding control is initiated. Closing speed is independent of welding pressure. Works with Ram Depth Limit Switch: For redundant system requiring both Electrode Continuity and Ram Depth Limit Switch closure. Palm buttons are perhaps the oldest machinery safety device available. The buttons have become higher tech, and they have been made more fool proof, but they essentially remain a large part of the safety protocols in many facilities. Palm buttons have one often fatal flaw, however; you must let go of the part to initiate the weld. 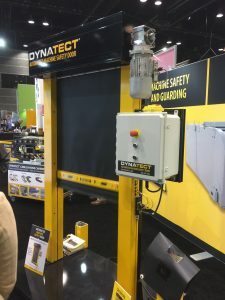 In the case of many tools and machines in the workplace, there are instances where it simply is not practical to build a fixture for every part you are running through your machine. Palm buttons are anti-tie-down (meaning you can not tape them closed… an old industry safety bypass). They often are infrared, and detect your hands only (so a screwdriver will not initiate the welds). They work with gloves. The buttons are typically mounted to the machinery, or on a portable stand. Physical guards are usually used in conjunction with light curtains and/or palm buttons. They are generally comprized of aluminum extrusion profiles and clear polycarbonate sheet. It is necessary that they be custom built, per application, as the unlimited varieties of parts and sizes would render a “standard guard” unusable in most situations. Physical guards must be quoted after an engineering study of your range of parts. 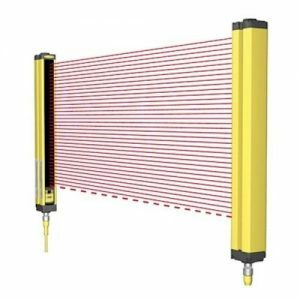 Light curtains are most often used when physical guards are present, and when there is a high volume of the same parts being welded on the same machine. They prevent an operator from having their arms and hands in the welding area during welding. They are safe and effective. Light curtains can prove problematic with large parts or sheet metal. Like palm buttons, light curtains often require an operator to lay the part into a nest or fixture. This can be impractical for low-volume parts runs. Light curtains also must be quoted after an engineering study of your parts. Safety doors are like garage doors that open and close rapidly. They often have a clear-vinyl strataglass window. These are commonly used with automated MIG/TIG welding stations. They work very similarly to light curtains but provide a physical guard instead of an invisible light beam. The physical door can provide added protection from sparks produced by the welding process. They often have sensors to ensure the door itself does not create a pinch point. The doors can have the same disadvantage of light curtains, in that they will require fixturing or a nest to hold the parts being welded. They are not an economical substitute for light curtains. They require custom configuration per order. Safety doors also must be quoted after an engineering study of your parts. 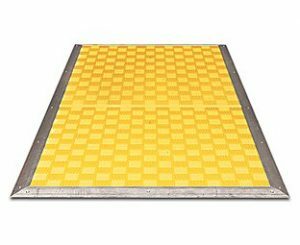 Safety Mats are pressure-sensitive safeguarding products that are designed to detect the presence of people on the sensing surfaces. These mats have two conductive plates that are held apart by non-conductive compressible separators. These mats can be placed in front of the loading station of a piece of equipment. If an operator is present, the machine will not function. These have a similar disadvantage of not being able to hold the part. Safety Mats also are custom ordered to fit the application and must be quoted after an engineering study of your parts.